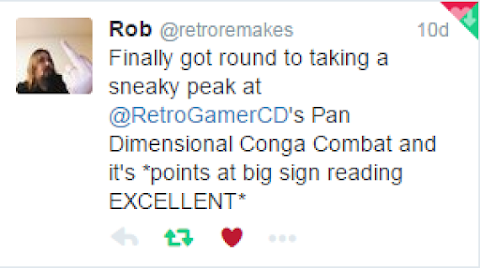 RGCD: Pan-Dimensional Conga Combat Release Imminent! 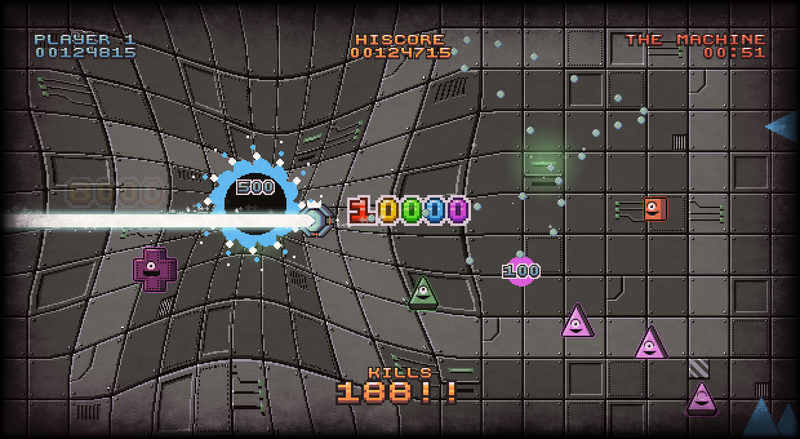 Pan-Dimensional Conga Combat Release Imminent! Exciting times! Here we are, 18 months after the first playable prototype of Conga Combat, and finally the game’s initial Windows release is only a couple of days away. Play Expo Blackpool proved to be exactly the stress-test we’d hoped for, with hundreds of games played bug-free and only a single additional feature request from the public (a few people pointed out that there should be a way to quit the game when paused). And that’s it - for now there’s no more work left to do on the Windows build. We were lucky enough to be one of a couple of dozen developers invited as first-rounders on the new Game Jolt marketplace (opening to the public on Wednesday), so we decided we’d use that opportunity of potential ‘feature space’ to set Conga free into the wild. The game will also be available to buy on our itch.io page as well, and we’ll be launching a Greenlight campaign to get the game onto Steam on the same day (Conga is a game that was designed to use online leaderboards, so it’s a perfect fit). We’re still working on the Android .APK; there’s some optimisation to do to see if we can get it running at at least 50 FPS on low powered devices, but more critically the shader code for the sine-distortion effects used on the game titles is currently completely borked on the Amazon Fire TV. The past three months of development-weekends have been pretty soul destroying for Jamie and I, a period of time that can be summarised as an ever-repeating cycle of finding a bug, fixing it and inadvertently creating another, but at the time of writing the game is pretty much 100% there. Amazingly, despite the hundreds of hours put in, we both still enjoy playing Conga in short bursts - which I guess is a good sign. I even recently managed to loop it twice, although I still haven’t managed to conquer the game by beating it three times. I do wonder if perhaps we’ve made Conga too brutally hard? I guess we’ll find out soon! Since the last time we wrote about the game, our main focus has been on implementing the achievements system, stats, player feedback/ratings, credits, intro and laying on a thick coat of final polish. Like 2014’s r0x EP, Conga has it’s own built-in achievements and stats system so that it offers players some reward even in the DRM free version of the game. Doing this has of course also made it easier for us to eventually implement other platform API’s, such as those used by Steam, Amazon, Google and (possibly/hopefully) Game Jolt. A huge amount of time was spent tweaking these so that the game doesn’t ‘give it all away in the first 30 minutes of play’, but to be brutally honest, if I set my mind to it and beat my double-loop record, I reckon I could probably manage it in less. The mix of scripted and randomised game events give Conga a LOT of replay value. That and the quick ‘one button to try again’ functionality combine to give it that compulsive one-more-go vibe. We’ve tested the game at several events and it’s genuinely hard to pull people away once they’ve got into the zone. 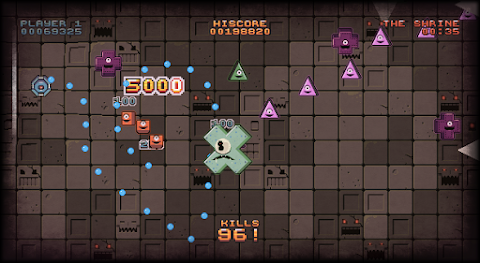 We’ve not made a big song and dance about the competitive local multiplayer aspect of the game, but it is quite a laugh (when you can actually make out what the hell is going on amongst all the flashing and screen shake). Although original, the game concept is admittedly quite simple, but we’ve made the very best game that we could out of it in all respects. The controls, the menus, the transitions, the flow of the game... a huge amount of work and attention to detail went into them all.